A short residual limb (amputation stump) limits the type and control of prosthesis available. The Paley Institute is in the process of opening an Osseointegration Center, one of the first in the United States. 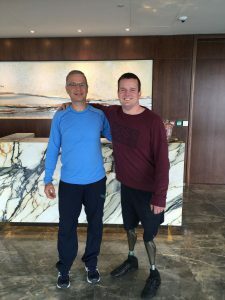 Osseointegration is an exciting new process that has the potential to dramatically change the lives of amputees. Drs. Paley and Feldman traveled to Australia in October, 2016, to learn more about the technique at the center that developed it. Learn more about the trip here. A very short upper tibia may not allow fitting with a below-the-knee prosthesis and may require extension of the prosthesis at the thigh or may function as an above-the-knee amputee. By lengthening of the short tibial remnant, fitting and function as a below-the-knee amputee can be achieved. The same is true for a patient with a short forearm stump. The remaining radius and ulna bones can be lengthened to permit below-the-elbow prosthetic fitting. Short femoral remnants can limit the ability to fit an above-the-knee prosthesis. The more awkward, heavier, and less functional hip disarticulation prosthesis may be required. Bilateral short femur amputees also have sitting balance problems. Lengthening of the short residual femur will facilitate above-the-knee prosthetic fitting. This treatment in bilateral amputees improves sitting balance as well.